Virginia Commonwealth University (VCU) became an ORCID member in June 2017, led by the VCU Libraries in partnership with the Office of Research and Innovation. In addition to recognizing the value of ORCID for helping researchers distinguish themselves and keep track of their work and affiliations, key stakeholders at VCU, such as the Graduate School, Office of Research and Innovation, Center for Translational Research, and program coordinators for training grants and special graduate programs with cohort based research outcomes, have seen the potential of ORCID to connect with both faculty and students to see where alumni go after leaving the university. As demonstrated by ORCID data visualizations from the Australian Access Federation and Science Magazine, ORCID data can be useful for measuring and demonstrating institutional impact in the wider research and innovation landscape. While VCU is still in the planning stages for integrating ORCID with their local systems, VCU Libraries staff have recognized that it’s never too early to begin educating researchers about ORCID and encouraging them to register, populate, and use their ORCID iD whenever possible. One of the biggest challenges of ORCID adoption at research institutions so far has been communicating the value of ORCID to researchers, and staff at VCU Libraries have been thinking strategically about how to get the message out to their researchers. Plans are underway for a concerted outreach campaign to build awareness around ORCID on campus, which will include more fliers, newsletter postings, blogs, announcements, and incorporating ORCID iDs in online faculty biographies. In addition to direct outreach to researchers, VCU Libraries also partner with research administrators and funded program managers to raise awareness of ORCID. So far, ORCID benefits for researchers at VCU have been framed as best practices for conducting research. While ORCID provides a mechanism for distinguishing researchers from each other, especially in the event of multiple researchers sharing the same name, VCU has impressed upon researchers that despite the uniqueness or commonality of a name, ORCID ultimately makes life easier for everyone the more it is used by contributing to accuracy in attribution of work, reputation management, and interoperability between systems. Because ORCID functions like an ecosystem, the more all stakeholders participate, the better ORCID will work for all involved. Diversity and inclusion is also a very important aspect of promoting ORCID, with considerations for Native American names, Asian names, and name changes over the course of an individual’s career due to changes in marital status or gender identity. 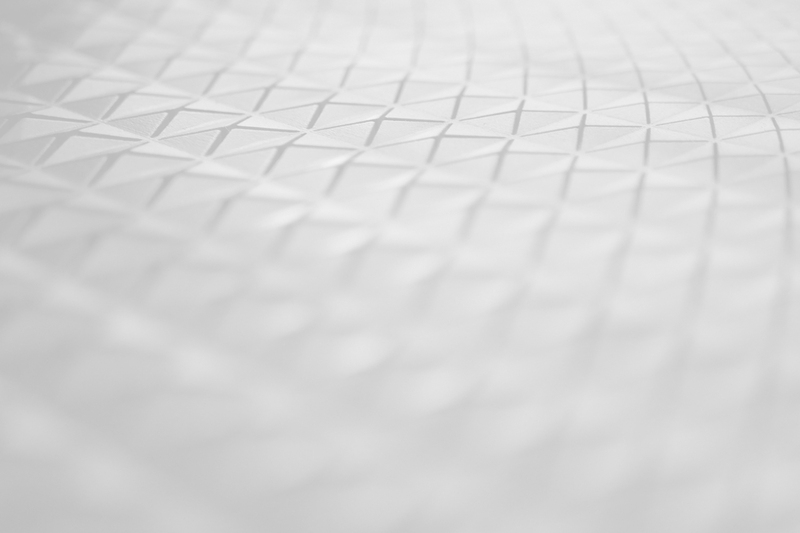 ORCID allows individuals to have control over their identities and where and how their name appears in the research landscape, consistently connecting the individual to their contributions over time. ORCID is also a gender-inclusive identifier that remains constant no matter what changes may occur in an individual’s life. VCU Libraries has specifically highlighted ORCID as a way to support and include trans and non-binary individuals, as names can be sensitive and incredibly important in identity formation and re-formation. 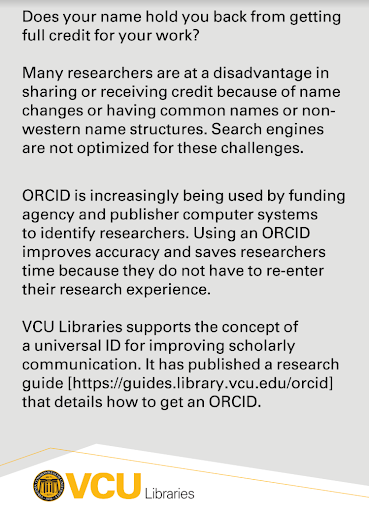 VCU Libraries has been partnering with the campus’ central IT unit to provide information for individuals related to name changes, with existing information now updated to include ORCID as a resource at https://ts.vcu.edu/askit/policies-and-publications/gender-name-notification/. VCU recommends using ORCID to assist with managing a consistent research profile despite name changes and other variables. Many thanks to Nina Exner, Jimmy Ghaphery, and Erin White at VCU Libraries for sharing the information in this blog post. For questions, please contact orcidus@lyrasis.org.